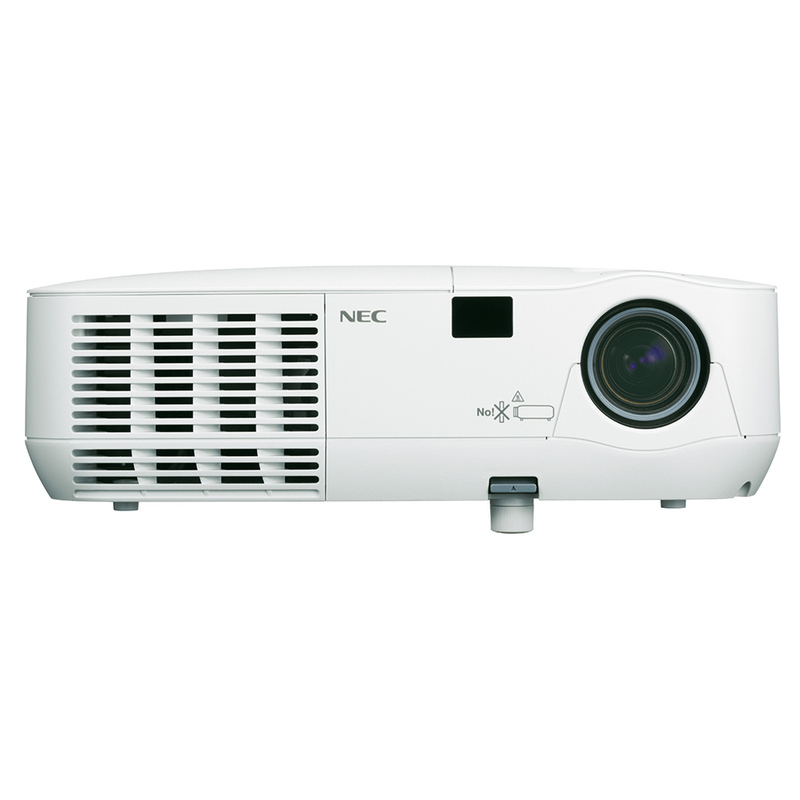 The NEC NP215 DLP Projector, a mobile projector that helps you deliver presentations with confidence. 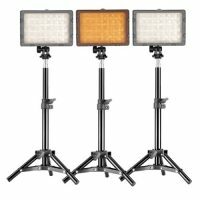 Displays bright, amazing images from the latest DLP® engine, is compact, lightweight and easy to use. 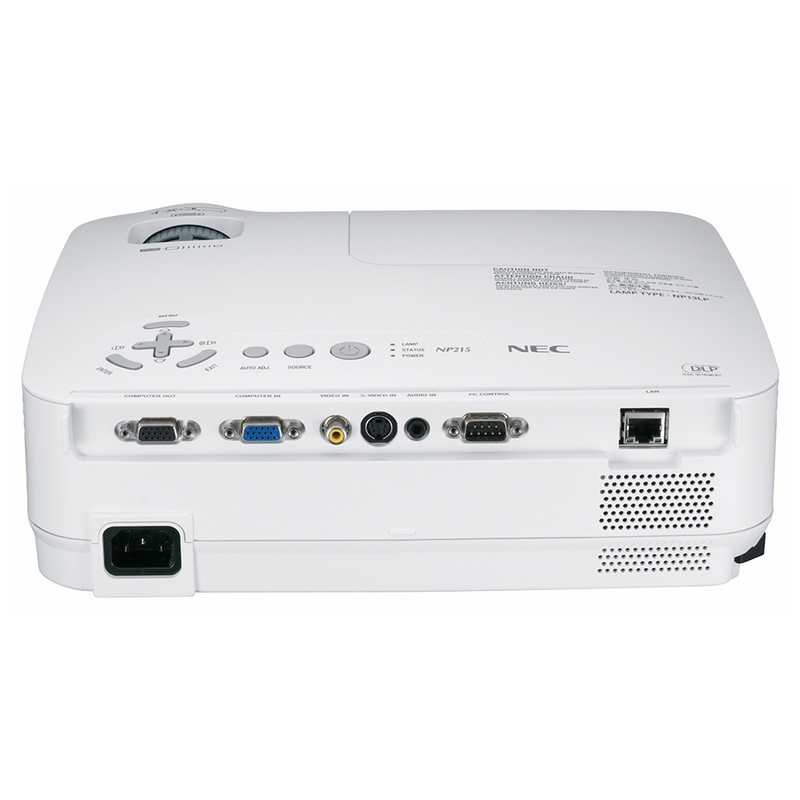 This NEC Projector sets up quickly, making it ideal for use in meeting and conference rooms. 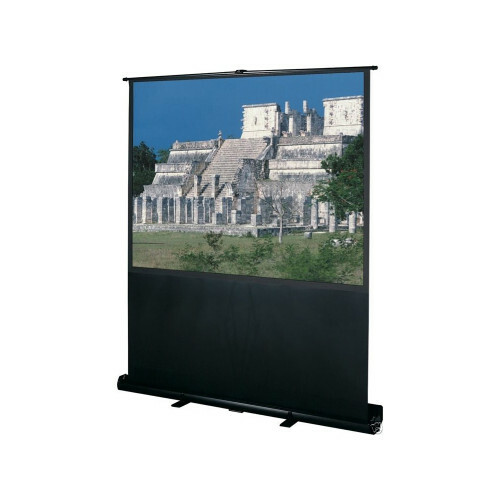 Categories: AV Presentation Rentals, Projectors, Video Rentals. The NEC NP215 is a high powered projector that’s as useful in the living room as it is in the conference room. 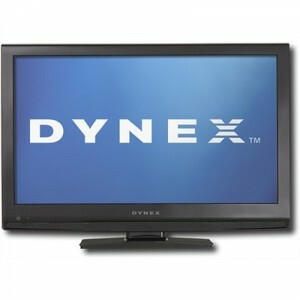 It can project high definition signals in the 720p and 1080i formats. This projector is people friendly too. Its input panel is clearly labeled and color coded. And it enables you to include the hard of hearing members of your audience by displaying Closed Captioning from program sources that provide it. CC also comes in handy to help people whose native language isn’t English. The NP215 sports a 0.55″ DLP chip with Brilliant Color. This chip increases color accuracy while it increases color brightness by up to 50 percent. And it processes six different primary colors rather than the usual three. What’s more, projectors powered by DLP light engines require no filters that have to be cleaned and replaced periodically. 2500 Lumens and 2000:1 Contrast Ratio Courtesy of Texas Instruments Bright, high contrast images from the latest Texas Instruments DLP engine featuring Brilliant Color technology with improved color accuracy can fill a medium to large room, even if there’s a fairly high level of ambient light. And DLP panels don’t require filters that have to be periodically cleaned and replaced. Environmentally and Budget Friendly ECO Mode technology increases lamp life up to 5000 hours, while lowering power consumption and energy costs. The Auto Power On feature activates the projector when a computer signal is detected via the RGB (15-pin) input connector. On the other hand, power management enables the projector to automatically turn off when an incoming signal is not detected from any of the inputs. There’s even a carbon savings meter that calculates the positive effects of operating the projector in ECO Mode, which is encouraged by an optional message at startup. Quick On And Quick Off Quick start (3 to 4 seconds) lets you begin presenting in seconds while quick shutdown (immediate power off with no cooling required after shutdown) ensures efficient energy usage and no wasted time waiting around for the bulb to cool down. And of course it can project in 720p and 1080i high definition. Closed Captioning Built-in closed captioning enables decoding and display of text information from a video source that contains it. Built in Wall Color Correction When your venue doesn’t have a screen handy you may end up having to project your presentation on to the wall. That’s not too bad if it’s a white wall but what if the wall is say, light green? Not a problem. The NP215 can compensate for nine different board and wall colors.